Are you considering a smart phone? Smart phones are an incredibly useful tool that everyone can use in their everyday lives. When making the decision, a lot of people focus on two major brands: the Apple iPhone and the Blackberry line of phones. It is important when considering one of the phones that you look at what you wish to do with the phone and the different aspects of each phone to make the best decision for you. After reading this you will be able to settle your iPhone vs. Blackberry debate. When looking at these phones, you must consider the cost, the applications available, the internet browser, and the phone capabilities. Cost of a device is usually a huge factor to most people. The iPhone can be a costly investment. At a few hundred dollars they are often not given at huge discounts to people who are signing a contract. However, the Blackberry phones can often be bought at a much lower fee. There are also several different models to choose from so it offers a more personalized phone instead of a one size fits all phone. In the applications department, however, the iPhone takes the prize. The Apple store offers hundreds of applications on every topic imaginable and many of them are less than a dollar. The iPhone comes with the application store right on it and applications are a simple click away for a great price. The Blackberrys, however, usually offer some free applications such as instant messengers and such, but many of the games are very highly priced and offered on a monthly basis. Data packages are often available for smart phones. If you buy a smart phone you must buy a data package. Many places offer unlimited data for a reasonable fee. If you have unlimited data then you are probably going to want a good internet browser. The Blackberry internet browser is limited at best. It views internet pages like any normal phone would. Email is delivered to your phone and instant messengers are available to be used almost like text messaging. The iPhone, however, as a great Safari internet browser. It views the internet exactly like your computer would. Many people really enjoy this about the iPhone. Both phones make great phones. They receive text messaging and make calls fairly easily. Some people do not like the iPhone’s large touch screen when making calls, but the benefits of that large screen greatly outweigh the bad. 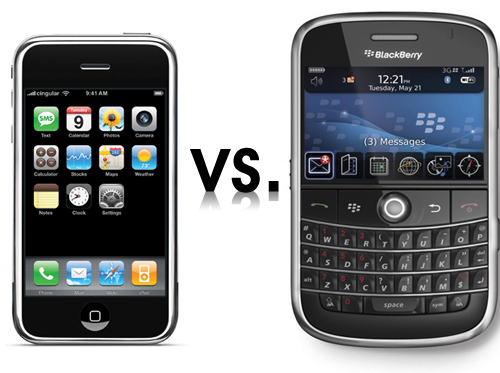 Mostly it is up to you to settle the iPhone vs. Blackberry debate for yourself. Hopefully you will make the best decision. Be sure to pick up phones and choose a good carrier.